As first light breaks over the tropical forest, a howl crescendos and peaks. For 30 minutes at five o’clock each morning, the silhouetted figures atop the 130-foot-high canopy call out their spot for the day’s pickings of sweet fruits and leaves yielded by the dense evergreens. The northern yellow-cheeked crested gibbon (Nomascus annamensis), a small ape whose color in females remains golden into maturity but in males darkens to black, sings and swings through the branches of the forests that span the borders of Cambodia, Vietnam, and Laos. The Veun Sai-Siem Pang National Park is located in northeast Cambodia’s Ratanakiri province, near the borders with Laos and Vietnam. So few remain of this subspecies—approximately 1,500 individuals across their full range—that it was distinguished from its closest gibbon relative only in 2010 and officially classified as “endangered” at the end of 2016. After seven years of research and documentation by CI on the biodiversity inside the gibbon’s Cambodian range, the government in May 2016 officially recognized 142,000 acres of the forest as a protected area, creating the Veun Sai-Siem Pang National Park. The area is home not only to the gibbon but also to several unique plant and animal species such as an iridescent lizard and a tube-nosed bat as well as the sun bear, cloud leopard, and giant ibis, Cambodia’s national bird. Total forest cover over Cambodia’s approximately 44 million acres of land has decreased from 73 percent in 1990 to 56 percent in 2012, according to the 2015 United Nations Human Development Report. Large-scale agricultural plantations account for at least 30 percent of forest loss within the country’s ape ranges, according to the forthcoming 2017 edition of State of the Apes. The Veun Sai area has been cleared of many species of luxury timber, such as rosewood, a staple of the Chinese hongmu classical furniture style, and loggers continue to harvest other large trees whose timber can sell for up to $20,000, the equivalent of more than 15 years of earnings for the average Cambodian. Through its project at the site, CI supports Ministry of Environment ranger teams who issue warnings or arrest loggers, document their activity, and require them to sign pledges against future timber felling and smuggling. Since the 2010 discovery of the new subspecies, CI primatologists have worked with a group of gibbons close to the ranger station to help them get used to the presence of humans. This group is the subject of longitudinal research as well as a tourist attraction. “Gibbons are the main reason tourists come here,” says Lov Kour, a committee member of the community-based ecotourism project and chief of Veun Sai village where visitors arrive after the nine-hour road and ferry trip from the capital, Phnom Penh. Cheab Thom, 44, hunted wild pigs, deer, pangolin, and other “high-value animals” around Veun Sai, his hometown, during his twenties. Yet, income from the sale of these species was still not enough to support his seven-member family. As a ranger since 2002, Thom patrols the national park and investigates signs or claims of logging and poaching. 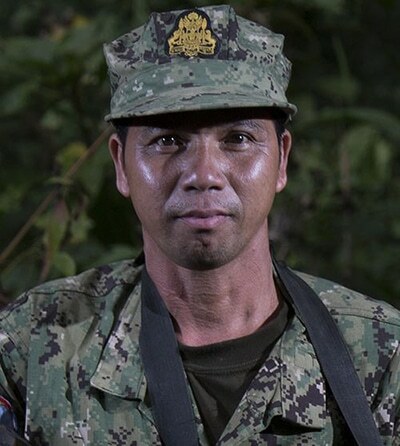 He is now able to provide for his family while using his knowledge to help the Conservation International team protect the forest’s unique flora and fauna. Since the project started in 2012, nearly 540 visitors—most from Europe, the United States, Australia, and New Zealand—have made the trek to Veun Sai, bringing almost $24,000 to the local economy. Veun Sai hospitality and transportation providers earn, on average, about $30 per tourist. More than two-thirds of the country’s 15 million people live on less than $3 per day. Visitors to the gibbon site are guided in small groups once per day, and most stay at a ranger station 45 minutes on foot from the site, sleeping under mosquito nets in raised wooden huts. Closer proximity or larger numbers of tourists could increase stress levels for the gibbons whose well-being, including mating patterns, can be negatively affected by human contact. All 25 of the world’s gibbon species and subspecies are at risk of extinction, with those in their natural ranges suffering the most from hunting and forest destruction, according to Ben Rawson, a primatologist who worked with CI’s Veun Sai project when the gibbon species was first identified. Based on projections presented in State of the Apes, all nine of the ape subspecies that are expected to lose their habitat by 2050 are gibbons. While the gibbon’s range falls exclusively within South and Southeast Asia, their exact population size is unknown but is estimated to be between 1 million and 2 million. 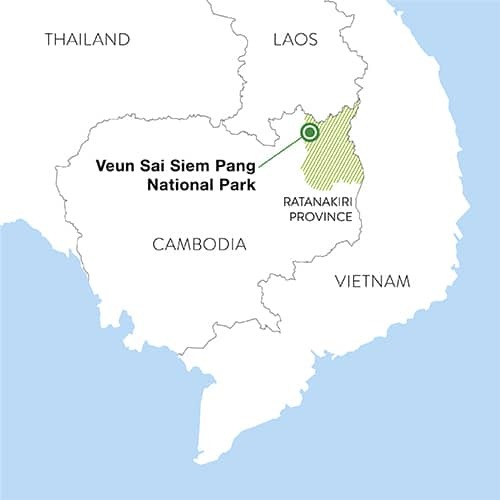 The Veun Sai project aims to strengthen protection of its gibbon population by increasing ecotourism in the coming years, improving accommodations and services at the lodge, and launching a marketing campaign that draws tourists from other popular sites, including the famed twelfth-century complex of temples, Angkor Wat, in Cambodia’s northwest.